It's been six months since I blogged, which by my standards is forever. But it's been a strange year, a challenging year, and it's challenges aren't quite over. In April, I went to the doctor with a peculiar problem retrieving words. I don't mean not being able to find the right word, I mean the inability to find any word, or come up with totally inappropriate words. It came and went, between bouts my vocabulary and recall were normal - as was my writing. For long periods at a time I struggled to have anything like a normal conversation - but wrote 115k words. When I looked back at the words - they were as fluent as usual and I couldn't understand it. I was sent for tests at the memory clinic, under the shadow of the word 'dementia'. There was a long, long wait. They ruled out brain tumour, stroke and since I aced the dementia test it wasn't that either. A psychiatrist took me aside and suggested I might be suffering from 'extreme stress'. I pointed out that waiting for three months hadn't helped. It's funny how you can see other people's strengths and weaknesses and not your own. It's amazing how we reach out to help, forgive and understand people we can see are struggling, while we can't forgive ourselves for the smallest slip. I've moved house twice in two years, I've coped with my husband's cancer and lack of certainty around the future, my biological children essentially left home, my precious step-children moved away, the health of both my in-laws declined, I wrote five books in three years and had two published, signed another deal and have just seen my first grandchild born. I didn't have a very good experience of my own grandparents, they offered little support to my parents. In their turn, when I became a parent neither set of grandparents were really engaged with the children. 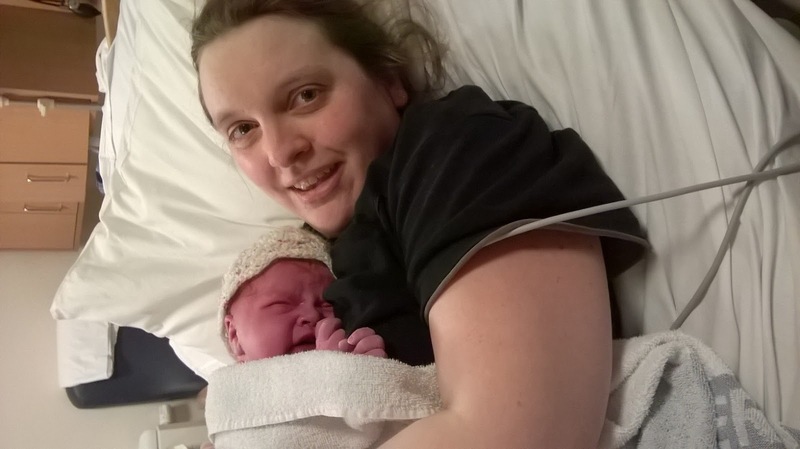 The prospect of becoming a grandparent - and maybe not bonding - was painfully real for a while in the summer. So I stepped back for a while. I disengaged from moving house and let Russell do most of the legal stuff. I gave myself time off being a wife and mother and moved some of my life down to the cottage. 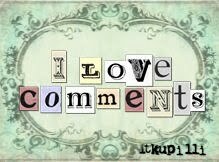 I trimmed back commitments, concentrated on what relaxes me, makes me better, stronger. I fell back in love with writing, which had never been a problem, and took time (and a course of antidepressants) to get better. And I fell in love with being a grandmother. 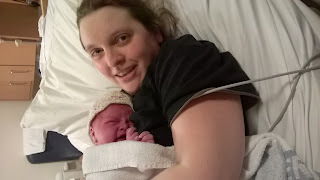 Lily Alison (8lb 3oz) made me a grandmother and watching / helping / supporting my daughter through her labour reconnected me with being a mother. Although we're approaching the end of the year with my husband's parents facing change and illness, although we're only just settling in to our new home and I'm not all better yet, things are definitely on the up. This is my beautiful, kind, smart and loving child. And her child. It has been a good year. ... are blooming. The family are well, the words are throwing themselves on the page in an orderly manner and the summer is coming (admittedly in fits and starts). Our gardens are filled with vegetables and flowers, the house is comfortable and the cottage is feeling more and more like home. Something else is happening. My son Kez is studying creative writing, which is great, we have plenty to talk about. But what has astonished me these last four weeks is seeing him grow as a writer. He has always had a great storytelling ability, he can make up an excuse on the fly, creates wonderful stories, helps me plot whole books... but when he went to write his own ideas down something stilted his words, his writing became removed from his own voice. Admittedly, second drafts would untangle some of the distant, stunted passages he wrote, they started to sound more like him, but he was reluctant to really let go and let himself live on the page. Then something happened, some combination of talking to his tutors, writing his assignments and getting feedback, exploring story in books, films and video games changed something. His first drafts are starting to sound like him, from the get go. His second drafts are opening that up further, and he's writing emotion as well as action. His dialogue, always a weakness, sounds like people. It happened quite suddenly after he wrote a ratty first draft of a contemporary short story. All his writing has shot up a gear, and better than that, he seems to understand a lot of what is better about it. Learning to write creatively and imaginatively is also about learning about the craft of writing, the techniques that transfer your imagination into words with the least loss of detail and truth. I am proud of him. While I do read his drafts when he asks me, and I do suggest punctuation or point out repetitions, he's much more comfortable doing the creative work. My previous role was mostly threatening him and bribing him with treats like a Labrador. 'Just a hundred more words - just another reference.' Even better, he has a real idea for a dissertation piece that could build into a novel. Whether he becomes a writer or not, I am very proud of the writing he's done in the last month. And it's all made him a better editor (which is what he wants to be). He is my first reader and first editor. I'm looking forward to seeing what he writes next. There's a spring vibe around. The bulbs are finished, largely because they started flowering in December (bonkers weather this year!). Although there are cold snaps to come (and Arctic winds forecast for the weekend) there is real warmth in the frequent sunny spells. In keeping with the spring theme, we have had a family wedding. Our middle son, Sam, married Becky, a lovely girl from a nearby village that he met at university. As luck would have it, she's a creative writing graduate. I wonder what she will write about in the future? In the meantime, we are all reflecting on the best wedding I've ever been to, and had the extra joy of having all of our children in one place at once - which doesn't happen very often any more. Not to mention gaining a lot of lovely friends and family through the young couple. Becky's parents made the whole weekend lovely for us all. I've run out of plot for the new book (it had to happen, I'm at about 60k words without stopping) so I'm working on the sequel to A Baby's Bones, which is also at the 60k point but pottering along nicely. It is creeping me out - always a good sign. I enjoy writing all the crime stuff, of course, but fantasy is a great pleasure to work on because it surprises me all the time. 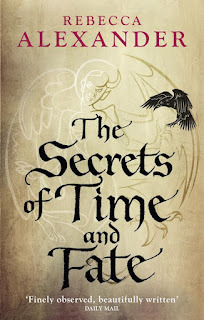 The Secrets of Time and Fate will be released on June 2nd and it's starting to get exciting. We're having a launch party at Walter Henry's Bookshop in Bideford on Wednesday 8th June at 7pm. 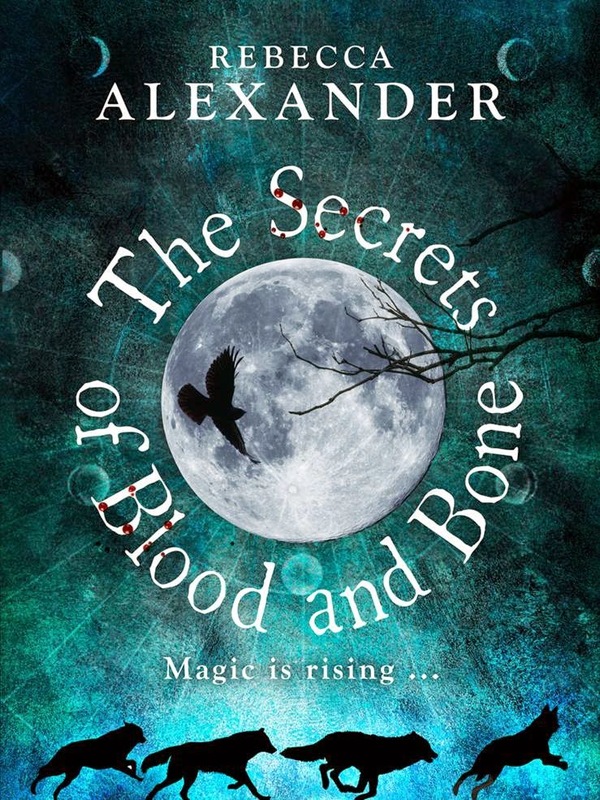 If I tell you the book includes a ruined cottage in the wilds of Dartmoor, a massive exorcism and a lot of pirates you might guess this is my favourite of the three books in the trilogy. Not to mention that I love writing my great friend Franco Marinello, an entirely made up Venetian sea captain that is a joy to follow around the Mediterranean. I shall be on the Island after that, then off to Winchester Writers Festival, a great privilege to be sharing my passion for fantasy with other writers. Another week of plot twists and characters surprising me. I've slowed down a bit (phew) and have written another eleven thousand words, the book is developing nicely and I know how it ends (sort of). It will be a relief when the Twins book comes back from my helpful agent with ideas on how to improve it, tidy it up etc. to see if it's ready to go out into the world. Scary stuff but exciting. The cottage we bought is in Appledore, a great fishing village full of lovely, friendly people. I have joined the Appledore book Festival volunteers, and hope to do some stewarding in September. I so enjoyed some of the workshops there last year. 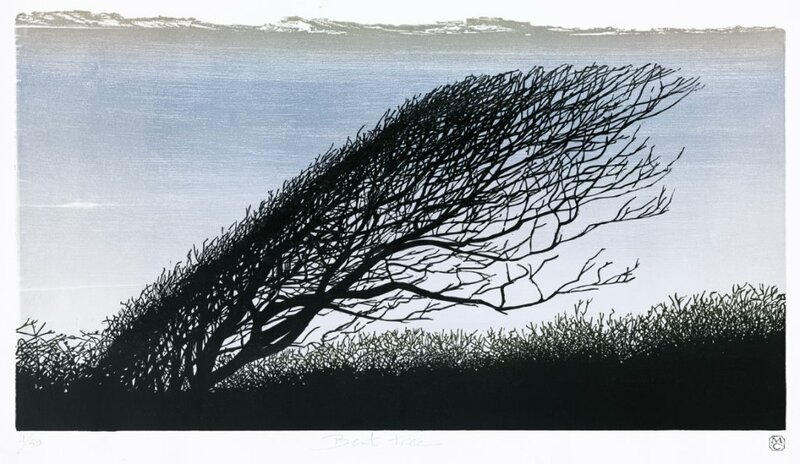 And if I had an even bigger wall I would go for one of the Pine Feroda prints that she is part of. She has a wall of prints at the Coffee Cabin in Appledore and her studio is in Hartland. I love prints, they do something that paintings don't do for me, they are like - well, printing words as opposed to scribbling in pencil. There is something permanent and authoritative about them. Making prints makes me write poetry, I don't know why. I've been teaching poetry all over the place and it's making me work on new drafts and old ones. Poetry makes you think about all the connected meanings of words, how they don't just have a dictionary meaning but carry culture and history and mean different things to different people. Words are wonderful. I'm at 26k, the tension is ramping up and I've fallen in love with my new character. This must be what it's like to have a plan for a book. Because I've already written this story before (eight years ago) there's a broad structure and I know the three principal characters very well. My writing rate is higher because I don't have to keep stopping to let the plot ferment, it's just developing from the original basic story. At this rate it will be done and dusted by June, ready to go away for a while to rise like dough, so I can work on it when all the ideas have settled in. Hopefully by the end it's one coherent book, and all in my head at the same time. At the moment I keep forgetting what the cat's called and whether I named her sister. I like my main character, Phoebe. I realise I tend to write about damaged women who fight back for their place in the world, never truer than for this character. My inspiration was a book I read many years ago abut the seven women who were attacked by the Yorkshire Ripper (Peter Sutcliffe) who didn't die. He killed 13 women in total, which is dreadful enough, but attacked these others with the intention of killing them. While I am glad they survived, it must have been a long road to recovery, both physical and psychological. 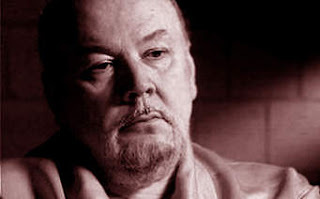 I was also inspired by an interview with Richard Kuklinski, the 'Ice Man'. As a psychopath, he was interested in his own psychological landscape, and that fascinated me. He killed (in his own words) approximately a hundred or more. I have some sympathy for the man despite his crimes - he had a nature that couldn't empathise with his victims and was exploited as a hit man. The questions was raised, was he a product of his abusive childhood or of his genes, as the child of a psychopath? I'm loving writing new stories. One of the things they don't warn you about is that most of the work of writing a book is actually rewriting, editing, polishing. Because I started several books at the same time they all needed reworking at the same time - oops. I got bogged down in edits. 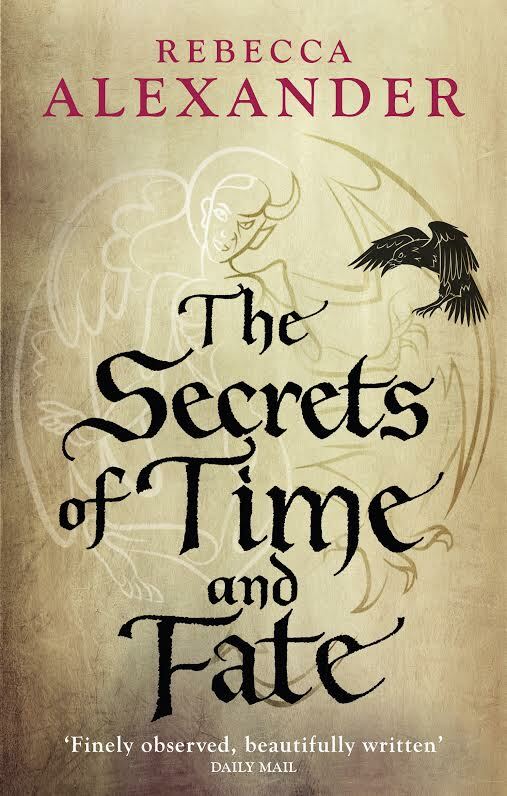 The Secrets of Time and Fate needed its final tweaking - just as important as the first structural edits - and just as time consuming. On the plus side, I really enjoyed sailing down the Mediterranean with my characters, feeling the waves under the keel, rowing in silence past Barbary slavers at midnight, exploring Brindisi and Crete and Corfu in the sixteenth century. The contemporary showdown was fun to write too, rounding off my characters' stories. Now I'm writing new stuff, and for once I have a plan! Not a very comprehensive plan, admittedly, but I have the structure of a previous book to work from, and that's helping. My three principals come from a book I wrote years ago, and although the focus has changed they haven't, not very much. I've managed to find four writing days in the last week, and have already written 16k words. I think this intensive writing is possible because I do already know where the story is headed, I don't have to work out what happens next all the time. Assuming the book will be about 100k at the end of the first draft, I'm hoping to be at 25k by the end of the week - a quarter of the way. How satisfying is that? When I get stuck, I'm going back to the Lorina project, which is taking shape too. I do realise I'll fall into the doldrums at some point, but I'm enjoying myself in the meantime. I've been asked to teach a novel writing workshop, which I'm working on. That should be fun! I also met a load of new writers at Okehampton, lovely people with a passion for writing. I'm looking forward to seeing what they come up with. Creative writing groups in North Devon are thriving.